There are several sets of standards that I use to help me create information skills lessons. Standards are statements of goals about what students should learn and be able to do. Information (or research) skills include many traditional library skills, such as how to use the computer catalog, but also include how to effectively and ethically use technology to create new information. I use standards from three different sources to facilitate my lessons: the American Association of School Librarians (AASL) National School Library Standards, the International Society for Technology in Education (ISTE) National Educational Technology Standards (NETS) for Students, and, of course, the Common Core Standards. I have provided outlines of the standards and links to the corresponding documents below. Want to know what lessons are coming up for your students? Feel free to check out my lesson plans, but please be aware they are a working document, updated and modified as needed, depending on student understanding of the material! 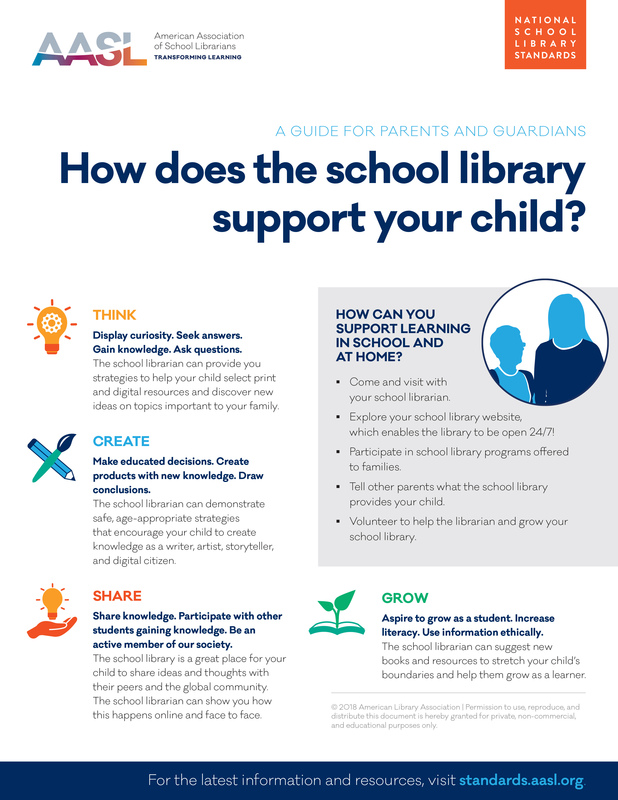 The National School Library Standards are based around 6 Shared Foundations and Key Commitments and incorporate the four domains of Think, Create, Share and Grow. Click the following links to discover what these standards mean to you as a Parent, Teacher, or Administrator. Wyoming, along with 44 other states, has adopted the Common Core Standards, which were developed by the Council of Chief State School Officers, the National Governor's Association Center for Best Practices, and representative educators, content experts, researchers, national organizations, and community groups. I will be collaborating with teachers to implement these new common core standards. To be ready for college, workforce training, and life in a technological society, students need the ability to gather, comprehend, evaluate, synthesize, and report on information and ideas, to conduct original research in order to answer questions or solve problems, and to analyze and create a high volume and extensive range of print and nonprint texts in media forms old and new. The need to conduct research and to produce and consume media is embedded into every aspect of today’s curriculum. In like fashion, research and media skills and understandings are embedded throughout the Standards rather than treated in a separate section." My lesson plans for the upcoming weeks. Please remember these are a working document, and are subject to update and change at my professional discretion.